I was born and raised on Long Island, NY where I currently live with my wife and two children, Ella and Luke. Throughout my childhood, high school and college years I was constantly competing in sports like football, basketball and baseball, though it was not until my late twenties that I really took up running. I turned to running to get me through some tougher times years ago as a stress reliever (a free one at that), and it has stuck with me. Now I am able to use running as a way to stay in shape in order to keep up with my two kids’ endless supplies of energy. Today running has offered my family an opportunity to bond together in our support of the cystic fibrosis community through Boomer’s CF Run To Breathe. Along with my wife Liz, I became involved with the Boomer Esiason Foundation and more specifically, Team Boomer, about three years ago when our son Luke was born with Cystic Fibrosis. Liz and I help Luke work to fight the effects of CF through the daily routine, which I am sure is shared by many of the readers here. We see how challenging this disease can be for those families and individuals that are impacted by it. Lucky for us, Luke is a relentless little dude who doesn’t know how to quit. At only three years old my little man inspires me every day with his amazing abundance of energy which is always coupled with that glowing smile. Team Campbell: Soon before Luke was born, a small group of us including my sisters; Katie, Kelly and Patty and my brothers-in-law; Pete and PJ, were discussing ways we could get involved in supporting a cause to help those battling CF like our new little guy would be. The discussion inevitably turned to Boomer Esiason and eventually to the upcoming inaugural Run To Breathe put together by BEF. That night, sitting around a table into the late hours of the evening, Team Campbell was born with the seven of us. Today, Team Campbell is made up of an incredible collection of the most supportive family, friends, colleagues and even generous strangers who have all embraced our amazing son Luke. These people have chosen to support him and those with CF like him in their own various ways. Back in 2011, Team Campbell brought more than 40 runners/walkers/supporters to the first Run To Breathe in Central Park and has been back every year in growing numbers. This year we hope to be able to continue the trend of growing participants and donations to BEF. 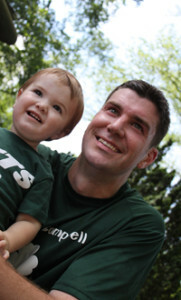 Hopefully some of you reading here will now recognize the green shamrock shirts of the Team Campbell crew on race day. Our favorite Team Boomer memory: Liz and I joke that each year’s Run To Breathe is like our Christmas, in that it is an overwhelming day filled with love, hope and happiness. The support that we see from our own team, as well as the thousands of others in Central Park that morning rallying around the same cause, is incredible. It leaves us with such a positive feeling that, though Luke will certainly have challenges in his life due to his diagnosis, he is not defined by this disease and can achieve so much, as many others with CF have been determined to do before him. I have had some uplifting conversations at this event with runners my age who have CF telling me that my son has so many advantages just by the fact that he was born at a time of such exponential medical advancement in the journey to find a cure for CF. The HOPE that prevails over the race course on that morning is contagious and leaves all of Team Campbell walking away with the feeling that a cure for CF is attainable in Luke’s lifetime. Why do I run? I run for Luke and Ella. I run so that they will know the importance of exercise and taking care of yourself physically, especially with CF being a part of our lives. I run so that when they are old enough, we can share in an activity that brings us together in a positive way. I run for Team Campbell. I run for Team Boomer. I run in the hopes that someday my son Luke will outrun me.